Readers showcase clever collapsing products that turn a little camper space into big storage opportunities. Nesting pots and pans are just the beginning. 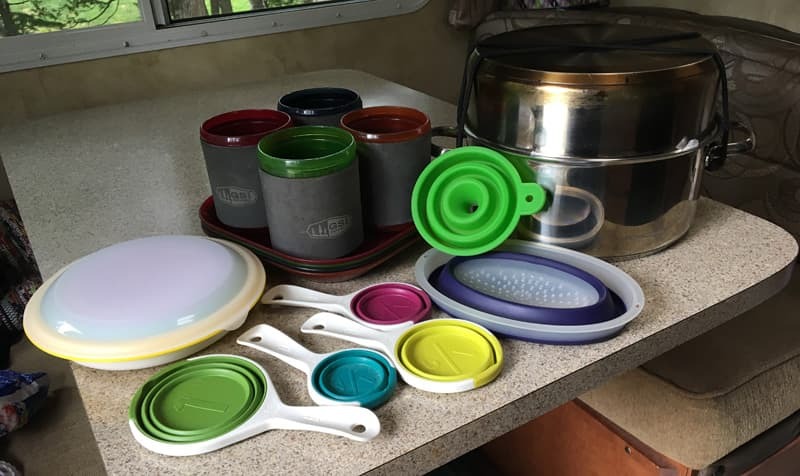 “I bought the greatest Lagostina pot set at Canadian Tire for $199. All handles are removable and interchangeable. The set came with four pots, a non stick fry pan, a steel fry pan and six handles (long and short). It also came with felt pads designed to stop rubbing when nested. The bonus is that it also has plastic lids. The beauty of this set is that if you remove the handles you can use them in the oven (lids are all steel and glass). Also you can fit all the pots on the stove because the handles don’t get in the way. 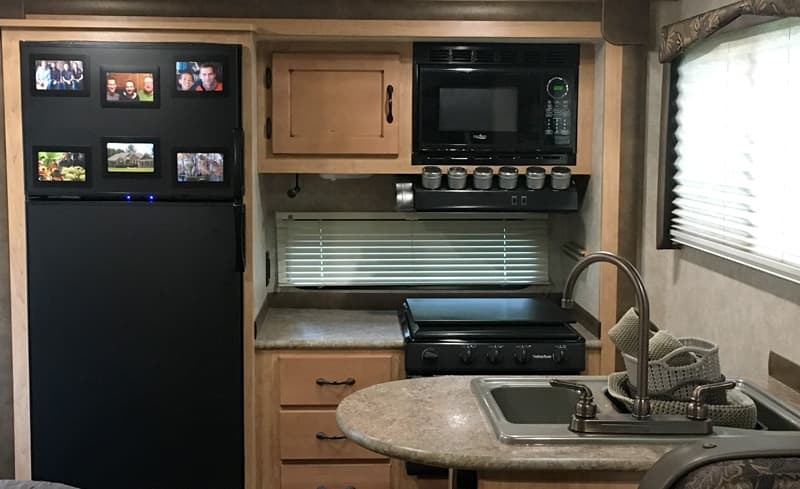 “Above is the kitchen area viewed from the cab end of the camper. I’m very lucky to have six drawers! What you don’t really see in the photos, because it is a difficult space to photograph well, is the large storage area under the sink. That is where I keep the Magna cookware set, a four-quart multi-cooker, a cutting board, and a Nespresso machine. Of course I have lattes when we camp! The crocheted boxes are from The Container Store. I use them for fruits and vegetables, and can wash them by hand periodically. They are great to minimize bruising of fruits and veggies in transit. I have quite a few spice jars stuck to both the front and one side of the hood. The quality of those magnetic jars varies widely. The ones from The Container store have the strongest magnets. I have never had one come down in the other camper, and don’t anticipate any problems with this one, either. Kitchen stuff can quickly take up space, and is a prime nesting location for me. 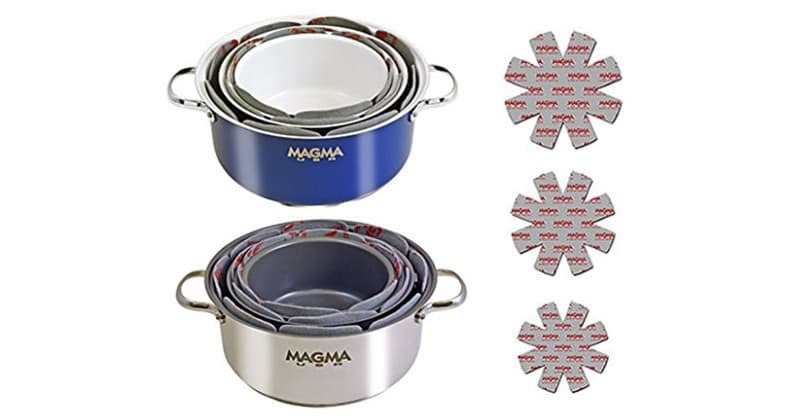 I use a 7-piece Magma Stainless nesting cookware set. I added the Magma ceramic coated interior omelet pan, which fits in the nested set. I also added a tiny stainless kettle from another manufacturer that fits in the center of the smallest pot for the times we boondock and only cook with gas. 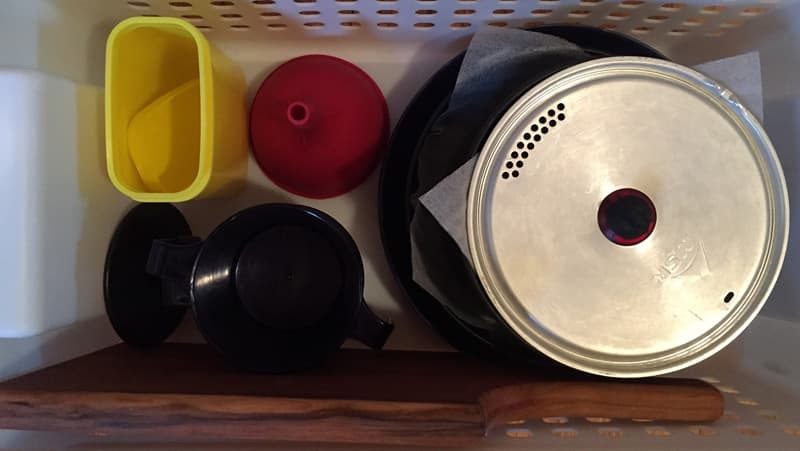 This way, all my cookware with the exception of several small baking sheets fits in the space required for one medium-sized dutch oven.